In short, I ordered 3 electric bikes from this company. I was dealing with a person named Eva Shei throughout. I had several weeks of email exchanges with Eva before I placed my order. I will upload the text exchanges and other documents to confirm what I am telling you is the truth. After I foolishly sent 1/2 of the payment to some individual named on the purchase invoice through Western Union that's when Eva went silent refusing to respond to any of my emails and when she did respond it was with lame excuses as to why the bikes were not being shipped. 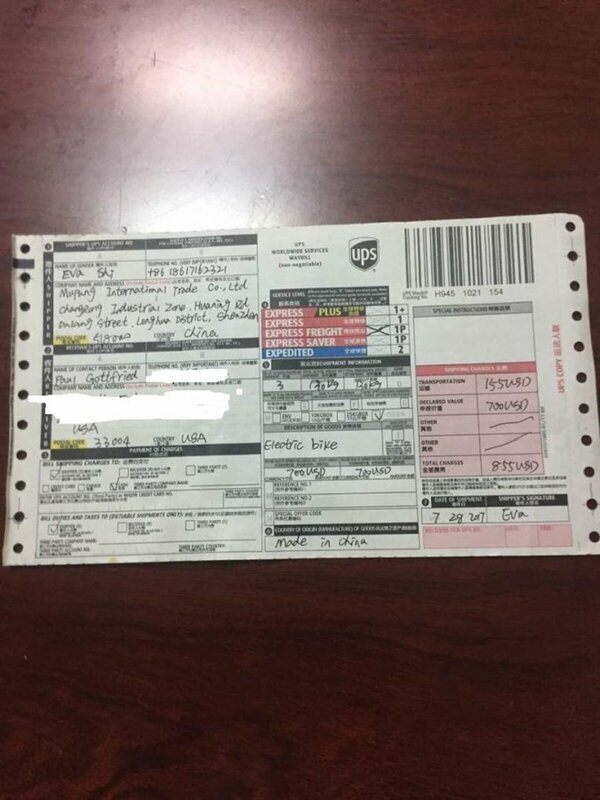 Eva the Evil sent me bogus DHL tracking information along with promises that the bikes were going to be shipped. Finally, Eva the Evil sends me a message that as soon as I send her the balance of payment the bikes would be shipped. That wasn't our deal. Our deal was 1/2 when ordered the other 1/2 once received. I have text messages and emails confirming everything I am writing about. I was duped and hope that others do not fall prey to these tactics by the unscrupulous actions of Eva the Evil. You can email me at gotlawyer@gmail.com and I will respond. I attached a copy of the UPS airbill that Eva the Evil presented in an effort to swindle me out of more money. I am an attorney practicing law in South Florida. DO NOT DO BUSINESS WITH THIS COMPANY AND DONT BELIEVE ANYTHING EVA SAYS. HERE IS THE COMPANY CONTACT INFO FOR YOU TO CROSS REFERENCE.